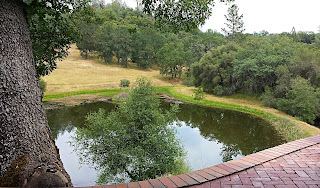 A wonderful excursion for a day will be a venture to Volcano in Amador County. There are several ways to get there and any of those take about 1 to 1 ½ hours of beautiful back country roads. When you get to Volcano you’ll see some neat historical things from the Gold Rush era. I’m sharing four ways to get to Volcano, each with its own unique drives. Throughout your directions are some photos to excite you about you day trip. HAVE FUN !! 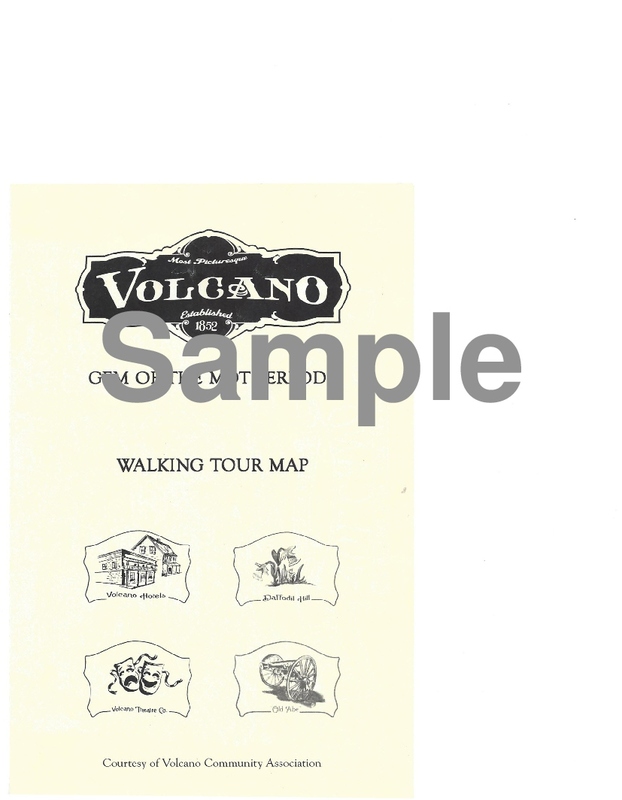 Once you get to Volcano be sure to find the "Volcano - Gem of the Motherlode - Walking Tour Map" at the General store or almost anywhere if you ask for one, or they will tell you where one is. 1) The longest is going up Omo Ranch Rd. to Highway 88 (Carson Pass Highway & the first scenic highway in the United States). Getting to Omo Ranch you have two choices: a) Perry Creek Rd. to Slug Gulch Rd to Omo Ranch Rd. or b) Fair Play Rd. to Omo Ranch Rd. 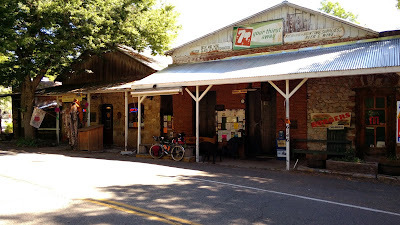 Once on Omo Ranch from Fair Play it is about 11 miles to Hwy 88. Then turn right toward Jackson (West) and go down to Shake Ridge Rd., turn right & go to Daffodil Hill. Shake Ridge Rd. turns right, but you need to go straight onto Ram’s Horn Grade into Volcano. On the edge of Volcano the road changes names to Consolation. You drive by the Volcano Union Inn: a great spot for a lunch on their patio. 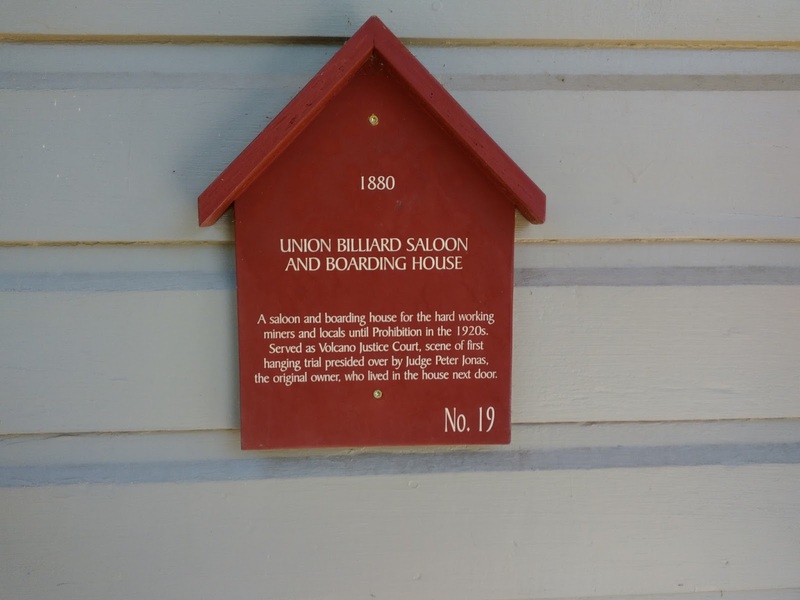 Volcano Union Inn - Great place to stay and for a summer lunch on the patio. If you like, you can take Shake Ridge Rd past Ram’s Horn Grade down to Charleston Rd. (about 3 miles), turn left and go into Volcano from another direction. 2) The most direct way is to take Fair Play Rd. to Mt. Aukum and follow Mt. Aukum past Sobon Winery and turn left onto Ostrom Rd. and over the hill into Fiddletown. At the stop sign turn left; then veer right and go to the stop sign. Turn left onto Fiddletown Rd. to Hale Rd. (about 2 miles) and turn right onto Hale Rd. to Shake Ridge Rd and turn left. About ½ -1 mile turn right onto Charleston Rd and into Volcano. For a different but longer drive into Fiddletown from Mt. Aukum Rd. take Cedar Creek Rd. (just past the Mt. Aukum Store & at the corner where the Post Office is – a left turn). About ¾ of a mile turn right onto Bridgeport School Rd. Turn right onto Tyler Rd. which goes into Fiddletown and turn left at the stop sign. An option is to take Lawrence Rd. which takes you to Tyler Rd. and then into Fiddletown. Then follow the directions above. 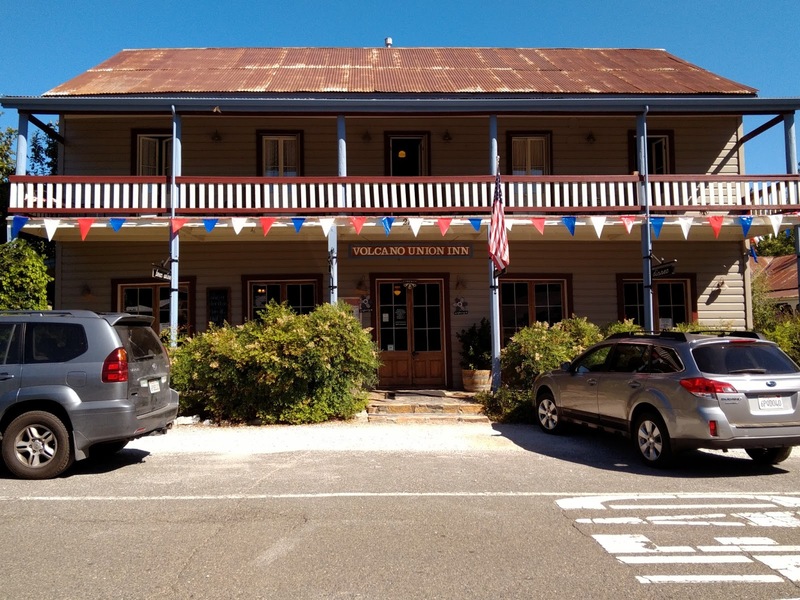 3) A little longer drive, but it takes you through Drytown, Amador City & Sutter Creek where there are antique shops and tasting rooms. Follow # 2 above past Sobon and continue to the 4 way stop sign at Highway 49 in Plymouth. Turn left and at the stop light turn left and go about five miles to Sutter Creek. 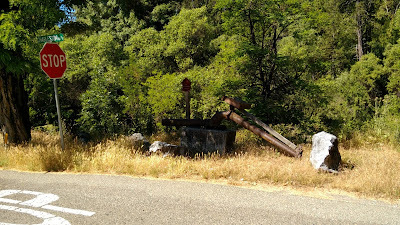 (There is a bypass so be sure to follow the signs to Amador City/Sutter Creek.) Drive through Main Street at the corner with the Police station, turn left onto Church St. It changes names to Shake Ridge Rd. about ½ mile out of town. Follow the directions in # 1. 4) For a longer day and more shopping stay on Highway 49 and use the bypass to go to Jackson. When you’re done doing whatever it is you do in Jackson take Highway 88 east out of Jackson. About 10 miles up the hill is Pioneer. Just outside the other side of Pioneer is a small road, Pioneer Volcano Rd. 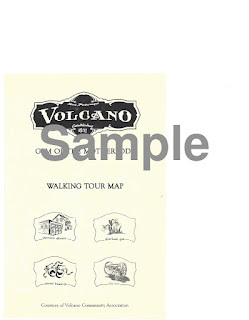 takes you directly to Volcano’s Main St. at the St. George Hotel. Your day will be filled with history and lasting memories of the Gold Country back roads. I usually don’t write about an individual winery in this blog. This exception is Cedar Creek Ranch & Winery. Last weekend (6/4/16) Karen & Ginger had their annual release party for their 925 cases of wine. That’s right only 925 cases total. Each varietal, Viognier, Sangiovese, Syrah, Petite Syrah and Ranch Reserve spent 18 months in the barrel, then more time in the bottle before being opened for the public to enjoy. This boutique winery and vineyard is tucked into the gentle sloping hills at the edge of El Dorado and Amador Counties at 2,300 feet elevation. The property is gorgeous and the vineyards are manicured, as if the vine canes were ladies finger nails. You meander along a quaint back country road for what seems like forever, then around one of the many curves appears the long drive up to the vineyards and the their home. Behind the home is a sprawling pond encircled with a ribbon of green grass amidst the golden grasses. Right out the back of the house just under the brick patio. I have been a big fan of the winery even before it actually became a winery. I got to know Karen Wood a few years ago, shortly after Lucinda’s opened. Karen was on one of her many fact finding missions by visiting and interviewing all those who knew anything about vines, vineyards, wines, wineries and even just gardening. She is a country girl by nature, so she felt right at home planting the vineyard. It took awhile but after her vines were in and beginning to thrive she became associated with one of the better winemaker/consultants in the area. She was a sponge, soaking up every bit of information Marco Cappelli provided. Quickly she flexed her wine making wings and became her own wine maker. Marco did observe and advise for a couple years, but now Karen Wood has become an excellent wine maker in her own right. All her wines are to die for. Great full bodied and the balance that makes good wine great. The reason I write this now is two fold; first, it is always gratifying to see and in a minuscule way be part of someone’s dream come to fruition and second, if you ever get to their annual release party you better attend. It is one of the best release parties in any wine region, anywhere. Ginger and Karen do it all first class and with love and goodness thrown in for good blessings. You can only see this wine label one of three ways. 1) You order a bottle or a case (why not two?) online; 2) a friend shares some with you or 3) you attend the annual release party. Well, maybe a few places in Plymouth: Taste Restaurant (rated one of the top 50 in the US by Open Table), Vintage Market and Amador 360. 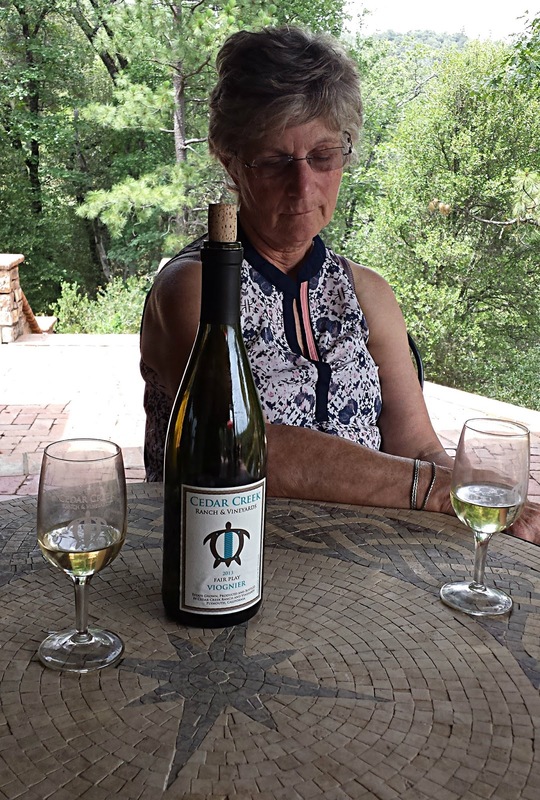 My lovely bride of 50 years is not napping, but she is eyeing that glass of Viognier. Cedar Creek Ranch & Winery website gives you all the necessary information you need to have the history of the old gold mining property, how to order wine and, when you attend the Annual Release Party, directions.